Such a rugged beast. The Casio G’z0ne is also headed to Verizon on Thursday, April 28 for $199, making outdoor fanatics feel slightly more Bear Grylls-ish. The G’z0ne will be available for $199 on 2-year contract, meets military standards for Immersion, Rain, Shock, etc., runs Android 2.2, has a 5MP camera and is about as secure as you’ll find any phone. 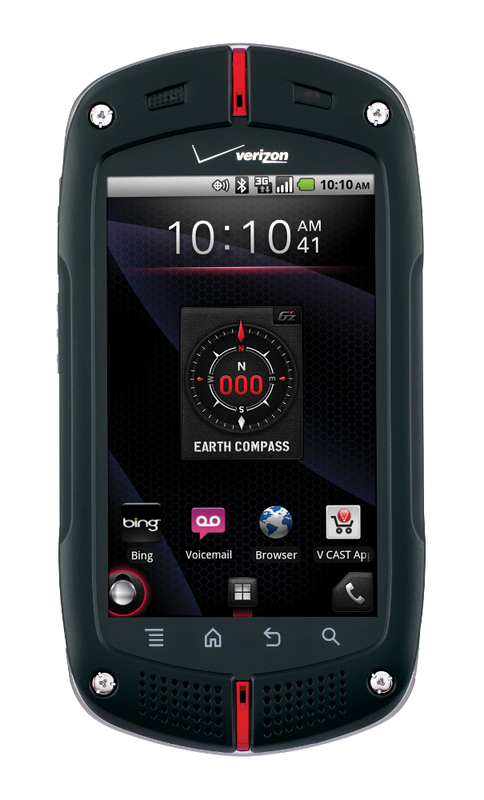 BASKING RIDGE, N.J. – Verizon Wireless and Casio today announced a new addition to the rugged wireless category and a new Android-powered smartphone in the marketplace, the CASIO G’zOne Commando™. Deployment ready, the Commando is a mobile office with high security features for secure corporate email; Wi-Fi for high-speed Web access; XT9 and T9 trace input for efficient typing; and snap-out menu for customized access to high-use applications. Designed to withstand the most extreme conditions, the CASIO G’zOne Commando easily transitions from work to play with advanced G’zGEAR software. As the ultimate outdoor tool in a mobile device, G’zGEAR operates in eight modes to enhance the active, adventure-driven lifestyle. With the help of its Triple Sensor technology utilizing direction, acceleration and temperature, G’zGEAR enables adventurers to perform at their peak. The Casio Commando is ideal for the business environment, especially for fields such as construction, transportation, manufacturing, utilities and healthcare. Workers in hazardous environments, such as construction sites, warehouses and factory floors, need a smartphone that has the capability to download blueprints, files and pictures; update project plans; access field force management, inventory access and corporate applications; and capture signatures. o Earth Compass – Functions as a standard compass, the GPS shows the distance and direction to several domestic and international landmarks, including Yosemite National Park and Mt. Everest. o Adventure Training – Takes training to a new level by allowing users to run with virtual opponents, like world-record holders, wild animals, or their own best personal performance stored in the training history. o Trip Memory – Plots and records outdoor activities along with location information to share with friends and family on Twitter™ and Facebook®. o Tides – Showcases the tidal graph for the day; time of tide ebb and flow; and current, past and future sea tide levels. GPS displays the nearest location map. o Thermometer – Displays current temperature in both Celsius and Fahrenheit with numeric and graphic thermometer readings and compares the current temperature across multiple locations. o Sun / Moon – Checks the time of the next sunrise, sunset, moonrise and moonset, and tracks the moon phases for your current location. o Star Gazer – Utilizes GPS to display the stars and constellation names based on the current season and time. The CASIO G’zOne Commando will be available online at www.verizonwireless.com on April 28 for $199.99 with a new two-year customer agreement. CASIO G’zOne Commando customers will need to subscribe to a data plan. Unlimited data plans are available to customers starting at $29.99 monthly access. Business customers who want to purchase the device can contact their Business Sales Representatives at 1-800-VZW-4BIZ. For more information on the CASIO G’zOne Commando or for other Verizon Wireless products and services, visit a Verizon Wireless Communications Store, call 1-800-2 JOIN IN or go towww.verizonwireless.com. Customers can visit www.CasioGzOne.com to experience the CASIO G’zOne Commando. Verizon Wireless operates the nation’s fastest, most advanced 4G network and largest, most reliable 3G network. The company serves 104 million total wireless connections, including more than 88 million retail customers. Headquartered in Basking Ridge, N.J., with 85,000 employees nationwide, Verizon Wireless is a joint venture of Verizon Communications (NYSE, NASDAQ: VZ) and Vodafone (LSE, NASDAQ: VOD). For more information, visit www.verizonwireless.com. To preview and request broadcast-quality video footage and high-resolution stills of Verizon Wireless operations, log on to the Verizon Wireless Multimedia Library at www.verizonwireless.com/multimedia. About NEC CASIO Mobile Communications, Ltd.
NEC CASIO Mobile Communications, Ltd. was spun off from NEC Corporation and took over the Mobile Terminal Operations Unit on May 1, 2010. On June 1, 2010 Casio Hitachi Mobile Communications Co., Ltd. was merged with NEC CASIO Mobile Communications, Ltd. The company brings together the many highly competitive technological assets possessed by NEC, CASIO and HITACHI to provide customers with highly innovative and reliable mobile phone products packed with cutting-edge technologies. For more information visit our website athttp://www.nec-casio-mobile.com/.